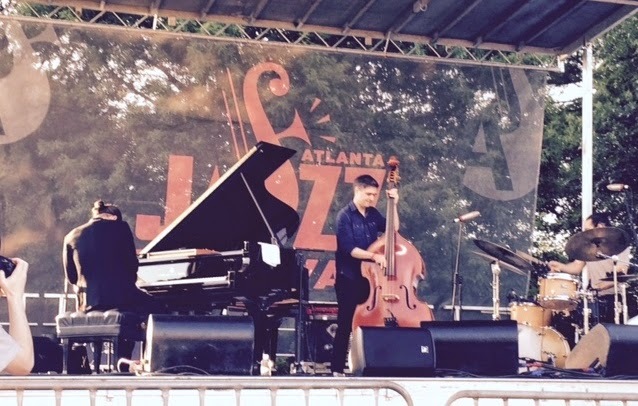 On a gorgeous evening, with a cloudless sky above, throngs of Atlantans swarmed over the rolling hills of beautiful Piedmont Park to participate in this year’s Atlanta Jazz Festival. The grass lawns, so carefully designed by Fredrick Law Olmsted and sons many decades before, offers the perfect vantage for the mass of spectators that come to listen to the music. The venue offers three stages, operating at times simultaneously, where artists were performing to grateful crowds. The main stage was set in the Meadow just outside the tenth street entrance off Monroe. The International stage is placed just South Lake Clara Meer in a hollow off Oak Hill. The stage featuring local talent was located northeast along the path closer to the Park Drive entrance. 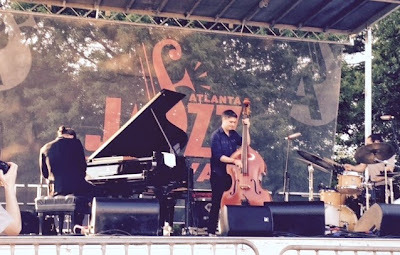 The park was teeming with visitors who strolled, sat on blankets, pitched tents or sat on folding chairs, all there to enjoy the park, the excitement and the music that makes up the Atlanta Jazz Festival. The Festival is one of the largest free open air festivals in the country and it is a major event for the City of Atlanta. This year’s music was a cornucopia of aural delights and our hats should go off to the organizers, generous sponsors and volunteers that make this mammoth event happen so smoothly. I arrived at about 6 pm and made my way to the International stage where the group Banda Magda was performing to an attentive crowd. Banda Magda hails from New York by way of Athens, Greece. The lead singer/composer is a pixie like character Magda Giannikou who captivated the crowd with here impish energy and sweet vocals. She sang predominantly in French and the music was an amalgam of Latin, Brazilian, French Pop, and world music. At times she reminded me of the Polish singer Basia (Trezetrzelewski) who had a successful career as a Latin-inflected, jazz crossover artist in the late eighties. While Ms. Magda’s voice does not compare to the three-octave range of Basia, she did show an impressive ability to stir the crowd, both with her syncopated accordion playing and the easy sway of her fluent French lyrics. The band is an international affair with Argentinean guitarist Ignacio Hernandez, who donned a tiger mask for Ms. Magda’s telling of a fairy tale inspired song, hand drummer and Tabla player Marcelo Woloski, Japanese percussionist Keita Ogawa and multi-instrumentalist and electric bassist fellow Greek, Petros Klampanis. Making my way across the park, it was astonishing how many people had come to this event. Many of the people just parked themselves along the many pathways or fields, content enough to listen from a distance to the sounds emanating from the various stages. I came to the main meadow, the site of the main stage, and was amazed at the vast sea of humanity that had set up camp to enjoy the festivities. Despite the throngs at no time was the crowd so overwhelming as to be oppressive and you could move easily from venue to venue. People were uniformly in festive but respectful spirits. The stage was setting up for the next act drummer Otis Brown III’s Quintet. 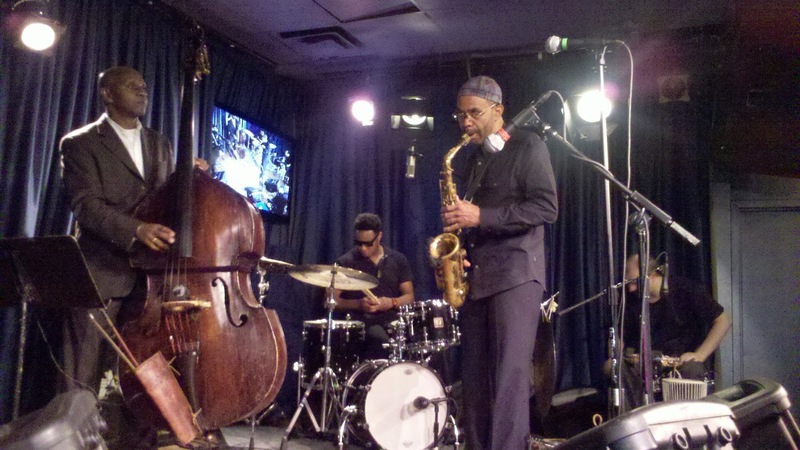 Unfortunately I didn’t arrive early enough to see talented saxophonist Marcus Strickland’s group who made up one of the preceding act. The sun was shining, but it was dry and seasonable as a single hawk circled surveying the mass of humanity from above. Mr. Brown is a powerful drummer who has worked with some many of jazz’s elite including the trumpeter/composer Terrence Blanchard, the saxophonist Oliver Lake and singer Kurt Elling. He has also collaborated with Grammy award winning pianist/composer Robert Glasper ,the new lion of crossover neo-soul/rap/jazz , who was featured on Mr. Brown’s latest release. On this evening Mr. Brown was joined by the trumpeter Marquis Hall, the masterful saxophonist John Ellis, bassist Alan Hampton and pianist and B3 player Terry Brewer. 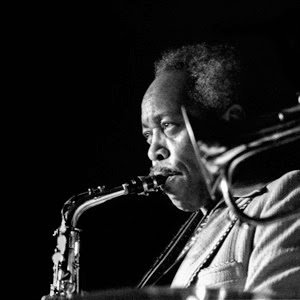 The group started the set with “The Way (Truth & Life)” from Mr. Brown’s latest release The Thought of You, which featured the tight dual horn playing of Mr. Hall and Mr. Ellis in the Blue Note tradition. I am an unabashed fan of Mr. Ellis’s playing and he didn’t disappoint with some fine soloing that was measured but spot on. 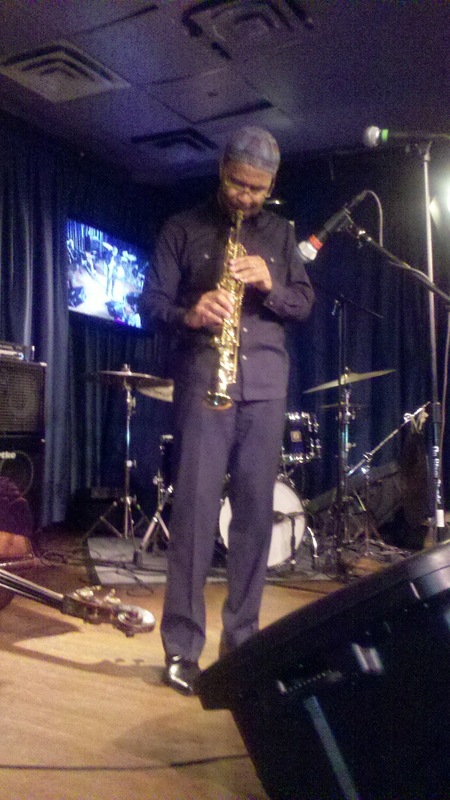 Mr. Hall is a effusive player with a strong sound and a clear tone. Mr. 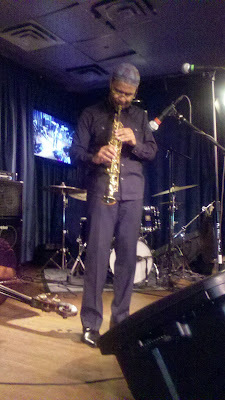 Brewer offered some interesting albeit brief solos and Mr. Brown and bassist Hampton laid down the bottom. The group played Herbie Hancock’s “ I Have A Dream: which Mr. Brown later spoke of as an anthem for him of the continued struggles facing Black people in this country. Mr. Brown introduced Ms. Christie De Shield to the stage where she sang ”Your Still the One,” a song sang on Mr. Brown’s album by Gretchen Parlato. Ms. De Shield’s does not have the wispy quality of Ms. Parlato’s, but she had no trouble using her own instrument to great effect. I decided to return to the International stage for a chance to see the great Cuban piano sensation Alfredo Rodriguez. Mr. Rodriguez was famously plucked from Cuba through the efforts of the great musician/ arranger Quincy Jones, who once he heard the energetic player, moved heaven and earth to see him get into the United States. Mr. Rodriguez was already in full swing when I got to the International Stage, joined by his trio of Henry Cole on Drums and Peter Slavov on bass. The Koln Concert record and as he has said it changed his life. 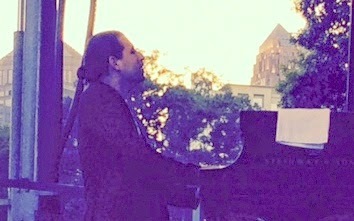 There is doubt that Mr. Rodriguez is a prodigious talent and he showed he could dazzle with spectacular runs, pounding percussive dynamics and a sensitive side that brought the grateful crowd to their feet by virtue of its pure aesthetic, despite having some technical difficulties with the piano. 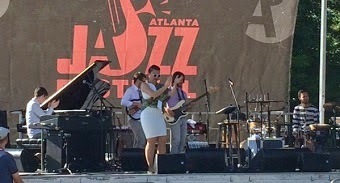 To be able to see this kind of talent for free in the spectacular surroundings of Piedmont Park is a true treat not to be missed. 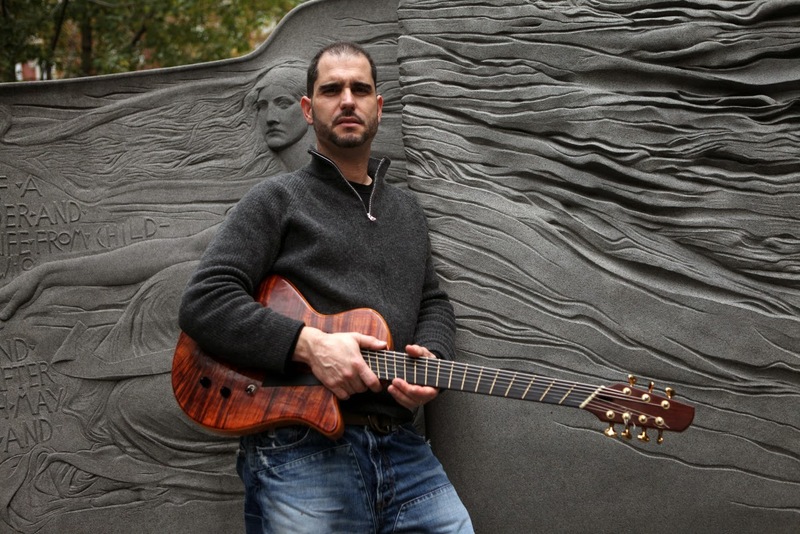 Today’s venue will feature among others Arturo O’Farrill’s marvelous Latin Jazz band, the fantastic Dianne Shurr, guitar wizard Stanley Jordan’s Trio and the iconic Pharoah Sanders with guitarist extraordinaire Kurt Rosenwinkel . If you’re in Atlanta don’t miss this opportunity to see these great artists. After first previewing parts of this album on Soundcloud I found myself going back to it again and again for the pure enjoyability factor. This is folksy, blues oriented roots music. Played in a frills free, unadulterated style that is both honest and endearing. 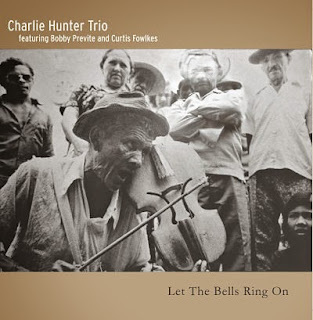 Hunter has an inherent sense of how to make his seven string guitar sing and Fowlkes gruff trombone voice is the perfect compliment to the Hunter gusty aesthetic. Traps master Bobby Previte plays in the pocket with unadorned punctuality and confident saunter. The music is gritty and cries out to you as being from the heart and the heartland, at times stinging, at times whimsical. A fun album you'll find yourself going back to this tableaux of songs for seconds. Check this one out.